I remember my first year teaching being completely overwhelmed by all of the math stuff shoved in my cabinets. I didn’t know what would I would use the most and what I would rarely or never use. I am sure that my first year teaching I did a terrible job utilizing the math resources available to me. 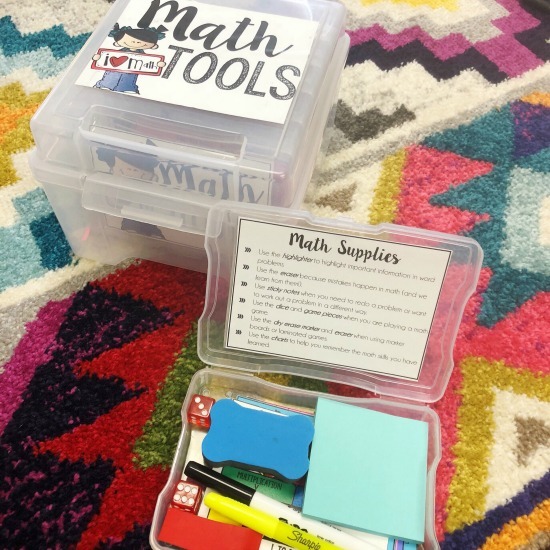 To keep that from happening to you, I will share on this post what I consider my must-have guided math materials and some others that are just nice to have. 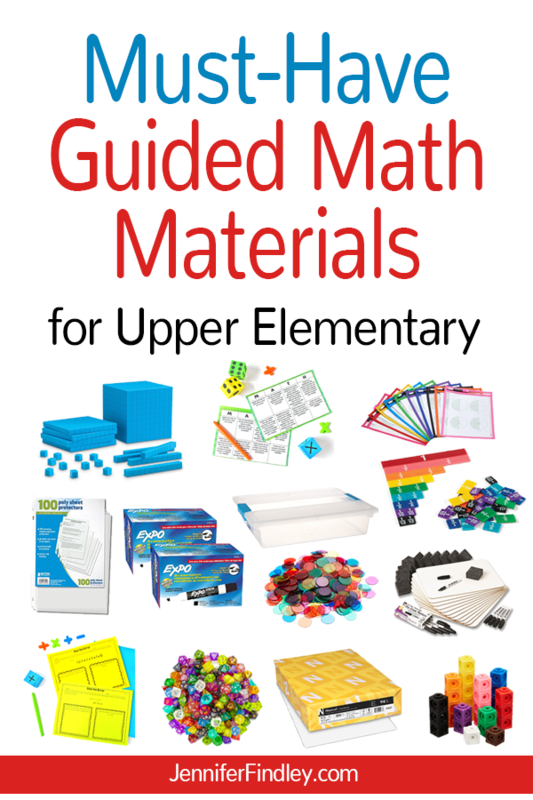 Hopefully, this list of guided math materials will help you dig around in your cabinets or help you know what to buy or request from your school. Let’s dive in to my favorites! We use dice a lot for math centers, creating numbers, and small group math activities. I bought this huge bag of dice from Amazon and I love it! It has so much variety and is perfect for differentiating. Partner games and activities are something my students love! 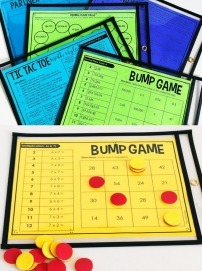 I use counters to have my students move around their game board and to play bump games. 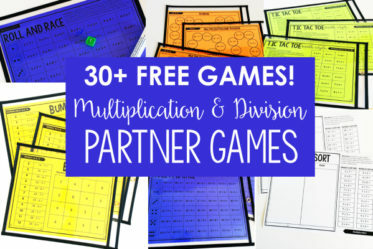 For FREE partner games and activities for multiplication and division math facts, click here. Full-page math centers and partner games are life-savers. You can pop them in page protectors and be done. If you have extra funds, you can even buy colorful dry erase pockets. 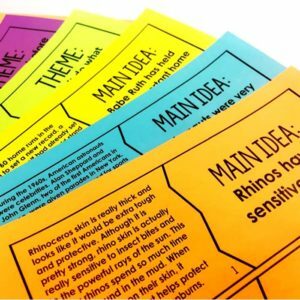 Since we use math centers a lot, I prefer to print them on cardstock and laminate them. This helps them last year after year even with rough 5th graders. 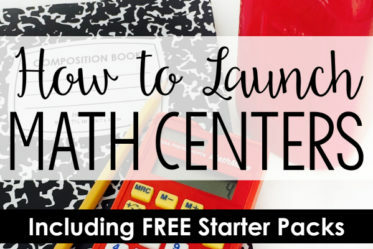 Want some free math centers to try out? 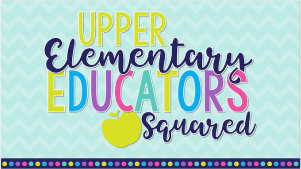 Click here to grab free math centers for grades 3-5. Bins or baskets are a must for organizing both guided math centers and small group activities. I use these bins from Amazon but you can pick up cheaper baskets from your local Dollar Tree or Walmart. 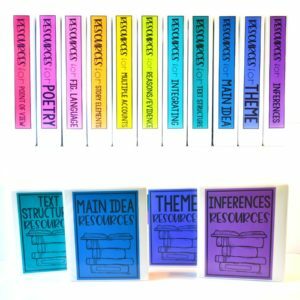 Click here to read more about how I organize my math centers. 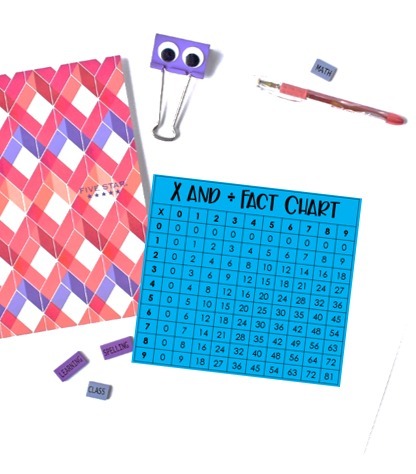 Click here to read more of my must-have math manipulatives for 5th grade and grab free printables to use with some of them. 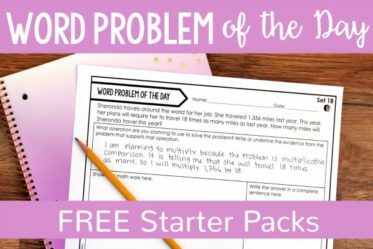 Multiplication and division facts are still a struggle for many of my students. While we work on this all year long, sometimes I need them to use a resource to quickly find a fact while we are practicing another skill. For this, I keep laminated fact charts on hand at my small group math table. Click here to grab the chart shown below. And of course, you will need engaging and easy to understand math centers and activities for your students to complete. When I say “easy to understand, ” I am referring to the directions and not the content. My rule of thumb when choosing math center activities is that if I cannot look at the game or activity and immediately know what to do, I don’t use it. I want my students (and especially those who struggle) to focus on the math and not learning complicated directions. 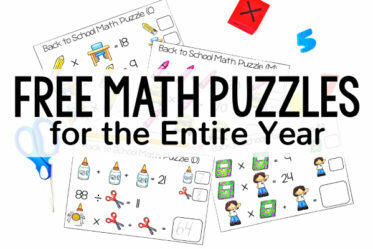 Click here to see freebies of my favorite go-to math centers for grades 3-5. We don’t use real spinners too often, but they are nice to have. Instead, we typically create our own spinners with paperclips and pencils. 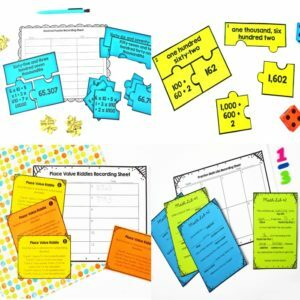 Math toolkits with printable resources are a great resource for small group math instruction and for your students to use as references in math centers. Click here to read more about these and grab the freebies to create your own. I use a simple bell to signal that we are ending our math center rotation (after giving a 5-minute warning). However, you can really use any sound you wish, including a timer set on a smartboard. Click here to read more about my guided math procedures. Colored cardstock is great to have to make math centers look more appealing and more importantly, to differentiate. You can easily color code math materials to help you remember which group gets which activities. As much as I love using math manipulatives, sometimes lugging all of them out can be time-consuming. I love using my tub of small group printable manipulatives. 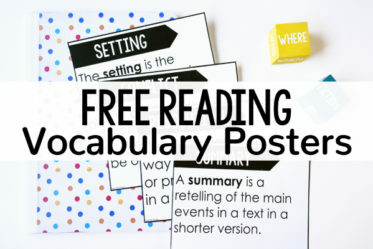 Click here to read all about this and grab the free printable manipulatives to create your own. 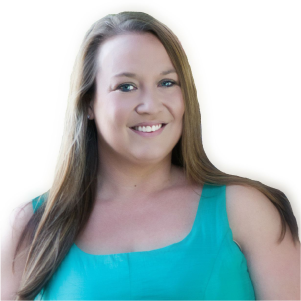 Amazon affiliate links are included if you wish to purchase the Amazon resources shared on this post. Dice can get loud, so foam dice is always a great alternative. This is definitely a splurge, but I love having my personal laminator that I can use to laminate a new math center or activity in a pinch. For some reason, my students really struggle with the relationship between multiplication and division. Using triangle math fact flash cards helps them see the connection and helps them master their division facts (one they have mastered the related multiplication fact). 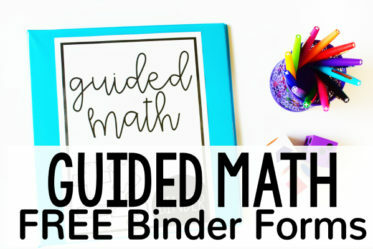 Those are my favorite guided math materials for 4th and 5th grade teachers. What would you add to this list? Let me know in the comments.